Ford continues its offensive in the pickup truck industry. Redesigned F- Super Duty Series came for the 2017 model year but Ford also revealed the updated light-duty 2018 F-150 at the last Detroit Show. The biggest news is the new diesel engine but Ford has also upgraded the gasoline mills. Styling and interior also feature some refreshments and new safety features are also available. Aside of that, Ford also made official its plans for the F-150 hybrid version which should come in 2020. However, something that is not official but has been rumored to cooking behind the curtain is the possibility of the new 2018 Ford Super Chief. The Ford Super Chief isn’t probably unknown for Ford’s trucks aficionados. 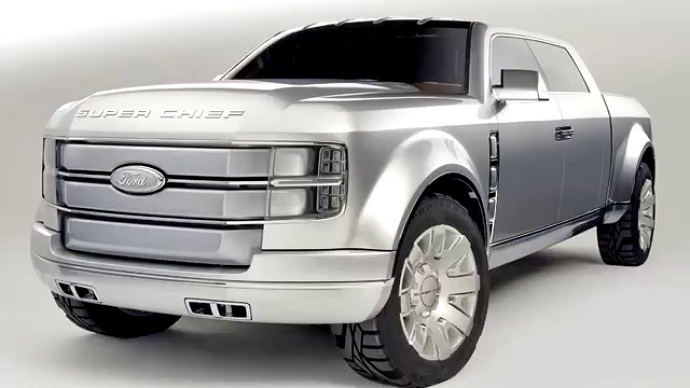 They know that Ford had the concept model named as the Ford F-250 Super Chief back in 2006. The prominent feature of this concept model was a tri-flex fueling system but model’s exterior and interior weren’t anything less fascinating. Ford showed this model as the luxury truck, not working machine and some reports now suggest that production version can soon see the light of the day. Unfortunately, Ford hasn’t commented on this rumor and everything we know about the 2018 Ford Super Chief is the matter of speculation. Based on some reports and as the name of the concept models suggest, the potential production version should be based on the latest generation of the F-250. This mean that this model should have the fully-boxed frame under the aluminum made body panels. On the other hand, rumors suggest unique and extravagant styling which should draw an inspiration from the Super Chief Concept model. The production model should adopt similar grille deign as the Concept which got an inspiration from the Super Chief Locomotives. The grille should be flanked by the unique LED-based headlights and front bumper should include fog lights and towing hooks. The back doors on the concept models were so called suicide doors but we don’t expect this feature on the production version. What is, however, expected if this model would get to the production, are unique and effective wheels. The model should also have a unique tailgate with specific taillights and the bed length should be 8-foot. Inside the cabin, if we want to believe in rumors, the Super Chief truck should be even more luxurious than the current top trims of the F-250. The interior design should include brushed aluminum and American walnut trim inserts while a rich brown leather should cover seats and other surfaces. The model should also get the latest infotainment and safety technologies. All the safety upgrades in the 2018 F-150 should be available in this model. When it comes to the powertrain, it is not clear what kind of engine or system this truck could get. The concept model was equipped with the Tri-flex fueling supercharged V-10 engine system. This system was able to operate on the gasoline, E85 ethanol and hydrogen. When powered with the hydrogen, this system can produce 400 lb-ft of torque. When operating on the hydrogen this system is also more fuel efficient. But what is also very important, the hydrogen powered V-10 emits 99 percent less CO2 than the gasoline equivalent. However, if the 2018 Ford Super Chief would see the roads soon we don’t expect this kind of the powertrain. More likely, the Super Chief could get some boosted version the current engines available in Ford’s part bin. Well, according to speculative sources, the 2018 Ford Super Chief should arrive at the showrooms in early 2018. Nothing has been said about model’s potential price. However, considering all potential features of this model it should cost well above the current value of the F-250 Platinum. This versions starts from around $62, 000.